The Northwind Bangui Bay Project, or simply the Bangui windmills, faces the South China Sea and generates electricity for the province. FOR the longest time, Ilocos Norte has been known as “Marcos Country,” or “Ilocoslovakia,” terms that emphasize the insularity of the province from the rest of the country in terms of progress and special benefits accorded it during the administration of strongman Ferdinand Marcos in the 1970s. While the Marcoses continue to rule the province, tourists now have a wider array of destinations to choose from as well as a myriad of activities to engage in. The visits to the Marcos Mausoleum and Museum (Barangay10-N Lacub, Batac City) where the late dictator's body is on display, and Malacañang of the North (Suba, Paoay), the official residence of the Marcos family in its heyday, are now mere historical footnotes and no longer the overwhelming reason for tourists to visit the province. Aside from the numerous destinations to explore, the delectable dishes and Abel Iloko woven products make for a compelling reason to visit the north. Eat bagnet (the name in Ilocos Sur for this crispy, deep-fried pork dish but which is actually known in Ilocos Norte as sitsaron or chicharon) with your favorite sawsawan (dipping sauce), and everything is all right in the world again. Wind-blowing wonder. While it is a modern invention, the Northwind Bangui Bay Project, or simply the Bangui windmills, is quite an amazing view to behold. About 20 huge wind turbines painted white, tower on the shore of Bangui facing the South China Sea, as they try to harness the power of the wind into renewable energy for the province. Netizens will understand when I say a Facebook cover photo of the breathtaking site will definitely make it an interesting conversation piece among friends for days. Religious heritage. 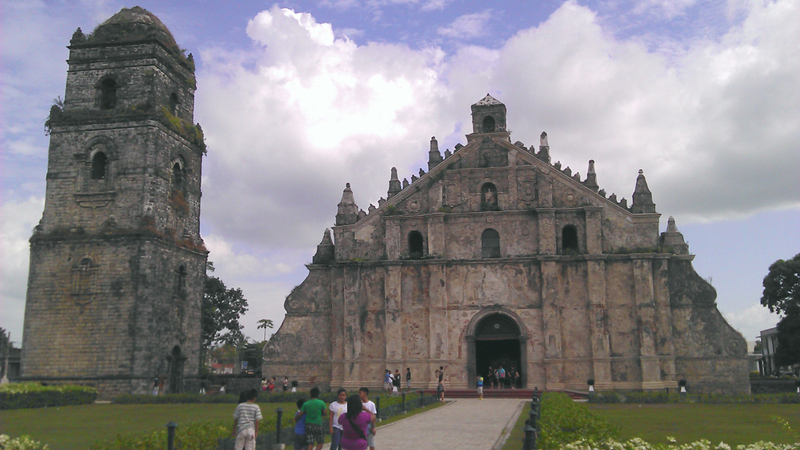 Completed in 1710, Paoay Church is on the list of Unesco’s World Heritage Sites for baroque churches in the Philippines. It is impressive in the way its builders tried to make it earthquake-proof as much as possible, fortifying its structure with bricks and coral. Its façade is washed out and no longer of the stunning red-brick color it may have originally been, and is dotted with floral renditions in stone almost Javanese-like in interpretation. Inside, the walls and retablo are simple with only the florid iron pulpit built in 1891 remaining as a reminder of the edifice’s former splendor. Bleached by the sun, the Kapupurawan Rock Formation in Burgos, Bangui. White rock. Gazing up at the majestic Kapupurawan Rock Formation in the town of Burgos is almost a spiritual experience. It’s as if an unseen hand has sculpted the magnificent white limestone, making it stand out from the rest of the scenery. Hewn by the wind and the sea, and bleached by the sun, the white rock (kapupurawan meaning “whitest” in Ilocano) can be seen from a viewing deck or up close, being reachable via short horse ride. Be a beach bum. The white-sand beach of Pagudpud is about an hour-and-a-half drive from Laoag City and now has numerous reasonably priced resorts catering to tourists. The trick, however, is to find the less rocky portions in the water, but to be sure, bring your surf shoes to protect your feet. What’s great about Pagudpud, specifically in the portion known as Saud beach (where the resorts are), is that it is quite easy to choose a deserted spot to put your things down, lay out your beach mat, and just go for a nap after a refreshing swim. The only noise is from the surf (careful…it is strong this time of the year), and the handful of people enjoying its crash on the shore. Anti-Boracay? If it’s peace and quiet you want, Pagudpud is definitely the beach to consider. Of course, tourists can also buy other items from this market such as traditional food delicacies and souvenirs for pasalubong for your loved ones, as well as wet-market food items for one’s Ilocano cooking experiments. The white-sand beach of Pagudpud, is at the northernmost tip of Ilocos Norte. Gorge on sitsaron/chicharon. Whoever invented this delicacy is most certainly a food god and needs to be properly revered in a temple of culinary good taste. There is nothing more comforting than a huge slab of succulent pork belly with its luscious fat deep-fried to a crisp. I personally like eating it with garlic fried rice along with another immortal Ilocano dish, the vegetable-laden pinakbet (from the Ilocano word pinakebbet or shriveled, so-called because the vegetables are cooked until they are shriveled), to help the heart recover from the cholesterol shock. Other celebrated Ilocano fare are the fresh ar-arusip (seaweed mixed with ripe tomatoes and onions), Dinardaraan (the Ilocanos’ version of dinuguan or pork blood stew), poqui-poqui (grilled sweet eggplants with garlic, shallots and tomatoes), lomo-lomo (soup made of pork tenderloin and innards), among other delicacies. THE sprawling Fort Ilocandia (Barangay 37 Calayab, Laoag City) is still the only five-star accommodation in the province, which offers guests a grand view of the sea amid ultra-luxe accommodations. Its breakfast buffet is quite hefty and affords guests a lot of choices, and has a swimming pool and mini-zoo to keep the kids entertained. What’s conspicuously missing, however, are free Wi-Fi connection and a full-service spa, which is part and parcel of any decent five-star hotel these days. Completed in 1710, Paoay Church is on the list of Unesco’s World Heritage Sites for baroque churches in the Philippines. The structure is fortified with bricks and coral in an effort to make it earthquake-proof. Hotel Tiffany (Gen. Segundo Avenue and M.H. del Pilar Street/) is for the budget-conscious traveler and is centrally located in the city proper. It has clean, spacious rooms and has free Wi-fi access (just make sure you tell the hotel reception to book your room near the router). Another option is to homestay. There are a few furnished houses for rent in Laoag City (about P1,000 a night) which offer anywhere from generous two to three rooms and bathrooms, with Wi-Fi access to the Internet. Just google. For more recommendations on accommodations in Ilocos Norte, go to http://tourismilocosnortehotels.com.